Most fennec foxes are happy to live in the desert, roaming about the hot sands in search of an evening meal, but Fuzzy didn't feel that way. Ever since he was a pup he had hated living in the heat. “It's the same thing every day. All I see is sand, sand, and more sand.” Fuzzy wanted to live at one of the oasis, where palm trees swayed in the breeze, pools of water dazzled in the morning sun and where you could find so much to eat that you never went hungry. One morning he began his journey. Leaving the pyramids behind, he ran across the sandy hills, in search of an oasis. He ran fast and he ran hard, from sun up to sun down, for days. At last he saw what he'd been looking for, palm trees. As soon as he arrived at the oasis, he lapped up water from the cool pools. He noticed several large tents spread out across the oasis. “Hmm. Who lives in those tents?” He ran over to one. “Look at all the pillows!” Seeing nobody in the tent, Fuzzy jumped on one of the pillows and lay down. Next to it sat a huge bowl of dates and olives, which he helped himself to. After eating till full he closed his eyes and fell fast asleep. Ahmed came back to his tent. The sheik had been out all day riding his camel. “I can't wait to eat those dates and olives and rest on my soft pillows.” He took off his dirty riding clothes and slipped into a colorful robe. When he went to lie down on the pillows he sat the fennec lying there. He picked Fuzzy up by the neck and threw him out of the tent. Fuzzy landed in the sand. It went up his nose and in his ears. He heard the sheik shouting about his missing dates and olives. Fuzzy ran off and hid behind a palm. “That was rude,” he said. “Maybe I should find a different tent to nap in.” He saw one off by itself. He crept up to it and peeked inside. “Nobody is in here. Good.” Darting over to the pillows, he curled up in a ball and fell asleep. 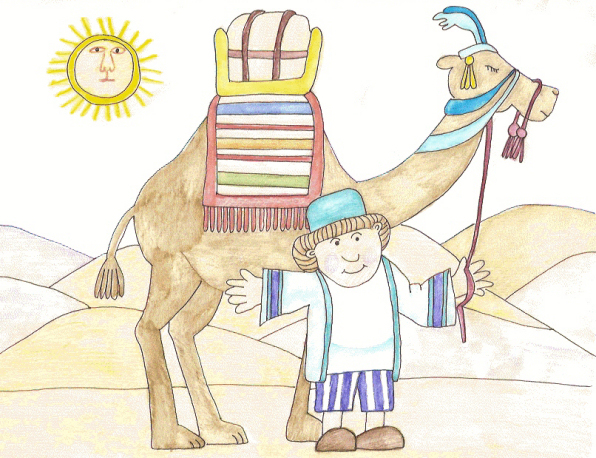 Hakim had been out tending to the camels all day. He'd brushed their coats, checked their hooves for stones and brushed their teeth. He was tired and wanted to lie down for his afternoon nap. When he went in his tent he saw the fennec lying on his pillows. “Out of here!” He picked Fuzzy up by the neck and thew him out in the sand. No matter what tent Fuzzy went to, it ended the same way. By the end of the day he had so much sand in his nose and ears that he could hardly breathe. He ran over to the pools of water and jumped in, washing himself. “You get out of my water,” a camel said. “This is the camel's drinking water, not your bath.” The camel bit Fuzzy on the leg and chased him out. 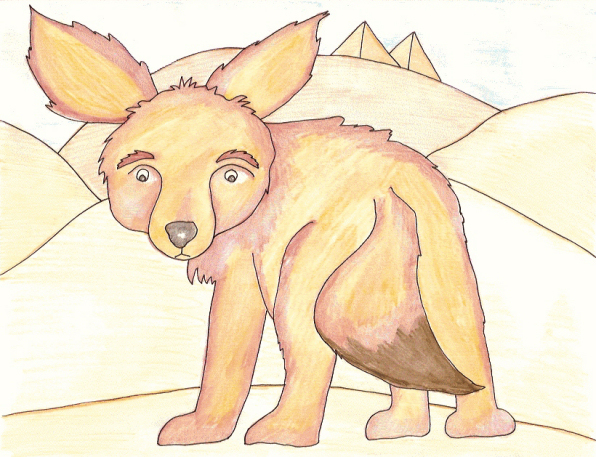 “I don't think I want to live in an oasis after all.” Fuzzy ran back into the desert, over hills of sand to the pyramids. “I think I'll just stay here, where there are no pools of water or tents.” Fuzzy never complained again.